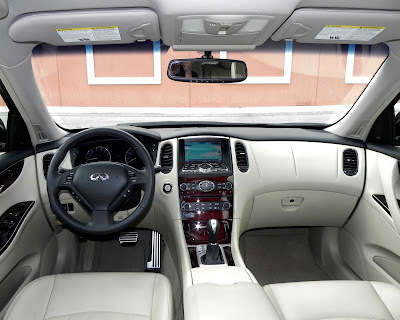 Shortly after the new year began, I had the opportunity to spend time in an Infiniti QX80 SUV, which I thought fit the description of a true “land yacht” as a colleague had dubbed the full-size conversion van I owned back in the mid-1980s and ’90s. I concluded that although the QX80 was packed with a lot of felicitous features, it was a bit big for my tastes and needs. Driving such a large vehicle can be a chore in urban environs where streets can be narrow and many spaces in mall parking lots tend to be the size of a stick of chewing gum. Too much bulk, however, is not an issue with the 2017 Infiniti QX50 I have been driving for the past week. 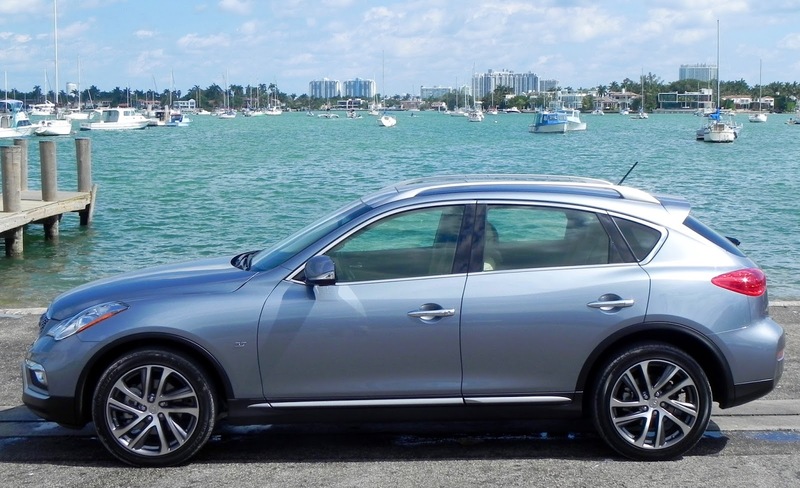 As a small SUV introduced as the Infiniti EX35 nearly a decade ago, the QX50 is more sedan-like in its handling and performance than it is “land yacht,” much more of a driver’s car than its big brother. Whereas the QX80 stretches out to nearly 209 inches long and weighs in at a hefty 5,644 pounds in 2WD and 5,888 with 4WD, the QX50 is almost two feet shorter at 186.8 inches and weighs in well under two tons with two-wheel drive (3,855 pounds) and just slightly over that with four-wheel drive (4,040 pounds). With a naturally aspirated 3.7-liter V6 pumping out 325 horsepower at 7000 rpm and 267 pound-feet of torque at 5200, the QX50 responds quickly and assuredly when pressed. The website zeroto60times.com clocked at 5.6 seconds from zero-to-60 mph. Mated with a seven-speed automatic transmission with a “sport” mode and manual gear selection capability, it delivers fuel economy at a rate of 17 miles-per-gallon city, 24 highway and 20 combined in either 2WD or 4WD configuration. Of course, if performance is all you are interested in, you are not likely spending much time looking over SUVs in a showroom, no matter how sprightly they are. Maybe you need all the space and third-row seating the QX80 offers. But if the weekly grocery haul and an occasional run to the local Home Depot or Lowe’s is about all the cargo needs you have, the QX50 may be your answer. It seats five, and the nearly seven inches of extra legroom they get over the 2015 model (up to 35.3 inches) is sure to make backseat riders less grumbling. And here’s a rather surprising number. Cargo capacity in the QX50 is listed as 18.6 cubic feet behind the second row, which is actually more than the 16.6 cubic feet the QX80 offers behind its third. Yes, you gain a bunch of stowage capability when the third-row seats in the QX80 are folded, but you can do the same with the QX50’s second row as well. 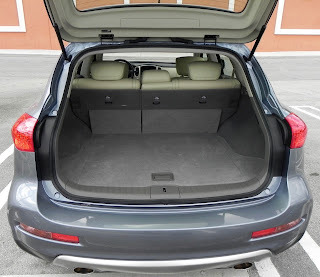 I was able to handle a six-feet section of bamboo fencing quite easily in the QX50 by folding the right section of the second-row seats, an act accomplished , thanks to the optional Deluxe Package, by the push of a button on the right just inside the rear liftgate. Infiniti has outfitted the QX50 with the kind of features suited to the luxury genre, including leather seats, eight-way power adjustable driver’s seat with lumbar support and four-way power passenger seat, moonroof with one-touch auto open/close, leather-wrapped steering wheel and shift knob, dual zone climate control with micro air filter, LED daytime running and fog lights, rearview camera, a center stack that is highlighted by Infiniti’s signature analog clock, Bluetooth phone connectivity, and a USB port. That and more are included in the base MSRP of $34,450. Optional features such as a Premium Package (upgraded sound system and advanced climate control, maple wood interior accents, etc. 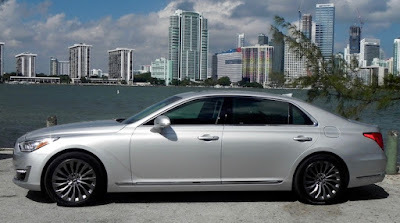 ), Premium Plus Package (navigation, around-view monitor with front and rear sonar system to aid in parking), Deluxe Touring Package (19-inch, five-spoke aluminum allow wheels over 18-inchers, HID headlights in place of halogen lamps, power folding second row seats, etc. ), and Technology Package (Intelligent Cruise Control, blind-spot and lane-departure warning, brake assist with frontal collision warning, and aluminum pedals) plus the destination and delivery fee but the final tab for my test vehicle to $43,735. Even at that price the QX50 is still close to the bargain category in a segment that includes entrants from Porsche, Jaguar, Mercedes-Benz, and Audi. What I liked about the 2017 Infiniti QX50: I found the few demands I asked of technological features easily handled. 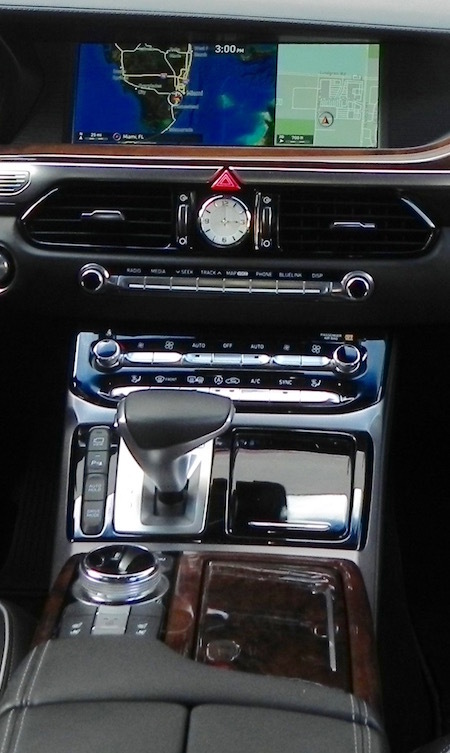 Infiniti has had the good sense to include knobs for such functions as surfing the radio dial. The ride is quiet and comfortable. 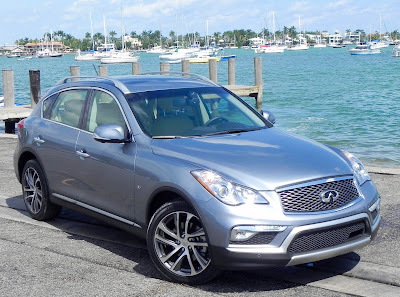 What I didn’t like about the 2017 Infiniti QX50: The fact that Infiniti hasn’t made significant changes to the QX50 since its debut as the EX doesn’t really bother me, but the company needs to smooth out some of the responses to voice commands. There is an extra step or two when it comes to tuning the radio, and when I asked to “call home,” I got a long list of numbers to choose from, none which was the number I have under “home” in my directory. My guess is that they were the “home” numbers to go with the names in the directory. Also, the fuel mileage is among the worst in its class. That eventually would take a toll as premium unleaded is recommended. 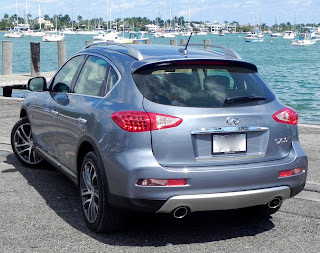 Would I buy the 2017 Infiniti QX50: Yes. It’s definitely should be on your list if you are shopping in this genre. It’s a good looking vehicle, a sprightly performer that also has a practical side, and could save you a few bucks in the deal. With a couple of exceptions, hatchbacks are generally more known for their utility and practicality than they are for their performance. One of the most notable of those exceptions, perhaps the most notable, is the Ford Focus RS. Those two tacked-on letters are almost magical in their effect. It takes the Focus up to a new level higher than even the souped up Focus ST when it comes to fun-to-drive quotient. The magazine Road & Track in a review of the 2017 Focus RS posted on its website a “track car designed as a practical hatchback,” and that about sums it up. Consider, the numbers for the standard Focus with its 2.0-liter, 4-cylinder engine are 160 horsepower and 146 pound-feet of torque. 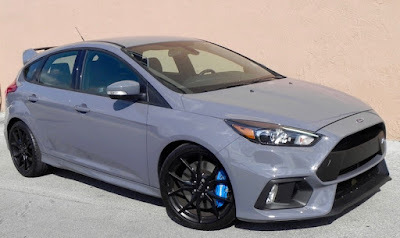 For the turbocharged ST they are 252 hp and 270 lb.-ft.
For the Focus RS and its 2.3-liter turbo-4, the numbers are a whopping 350 hp and 350 lb.-ft., unbelievable for a vehicle of this size and class. That cuts fuel economy to 19 miles-per-gallon city, 25 highway and 22 combined using required premium fuel, but oh what you gain in fun. This is a driver’s car. A six-speed manual is the only transmission offered, all-wheel drive is standard, and the Recaro seats, though perhaps uncomfortable for some with their stiff sides, provide solid support to keep you in position behind the wheel when accelerating through corners. The website zeroto60times.com clocked a 2016 Focus RS in 4.5 seconds, which is nearly two seconds quicker than the Focus ST and twice as fast as the standard Focus. Little wonder you’re going to have in-the-know enthusiasts stopping by your house when you have one of these sitting in your driveway. 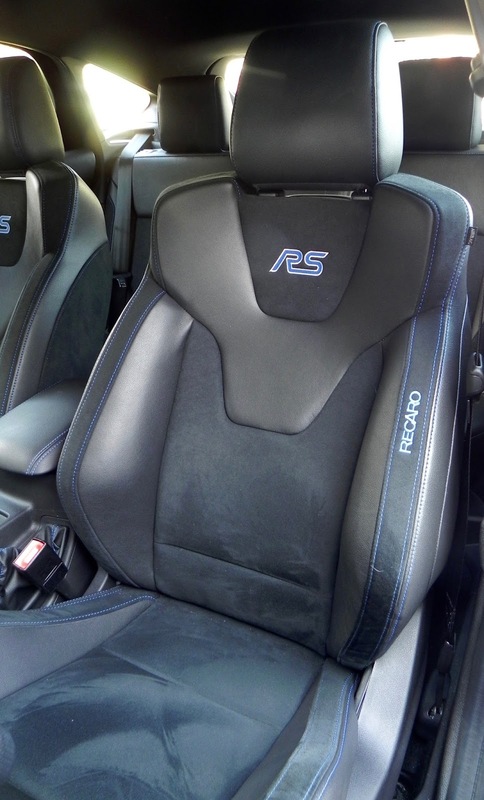 The power, all-wheel drive and Recaro seats are not the only unique features to the Focus RS over other Focus models. The Focus RS also gets a dual exhaust system, Brembo front brake calipers (hey, you’ve got to be able to harness all that power), launch control, special grille and rear spoiler, a performance shift indicator, and adjustable shocks. Auxiliary gauges at the top of the center stack display oil temperature and pressure as well as turbo boost, and the shift indicator flashes when approaching the engine speed limiter. Don’t get too excited its all-wheel drive. The Focus RS isn’t intended for off-road ventures but for street use. The company warns that anything more than a gravel road could result in damage not covered by the three-year, 36,000-mile bumper-to-bumper warranty. You can set the Focus RS to one of four driving modes with the push of a button on the center console. At startup, settings are in Normal mode for street driving. Pushing the button once programs it for Sport mode and more enhanced street performance. The other two settings are for Track and Drift modes and are for track-use only. You also can firm up the suspension by pushing and holding a button at the end of the turn signal stalk until the appropriate icon — it’s obvious which one — shows up in the instrumental panel next to the S for Sport. Inside, Ford has not forgotten all about creature comforts. Dual-zone climate control, leather-wrapped, tilt-and-telescoping steering wheel, push-button start, 10-speaker Sony sound system with HD and satellite radio, a rear-view camera, and cruise control are among standard features. Many of the controls are operated via buttons on the steering wheel spokes. 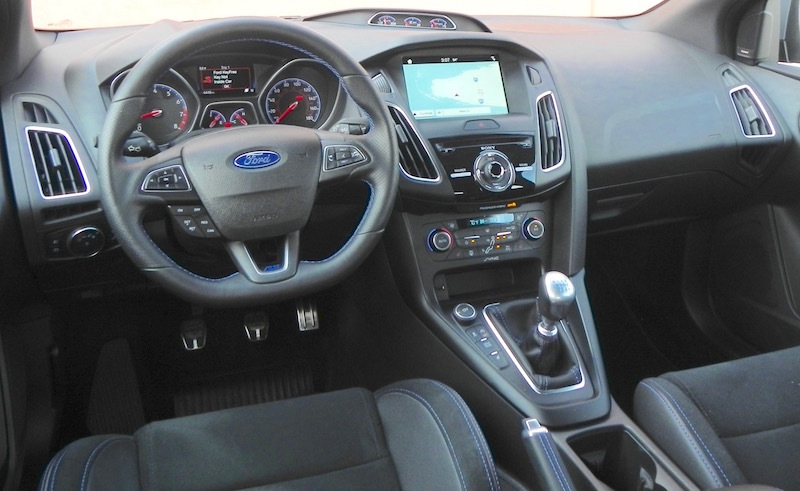 Also, Ford’s Sync3 system for operating infotainment features has been fine-tuned and responds readily to voice commands. You can zoom in on the navigation map by pinching your fingers on the screen like operating functions on a Smart phone. 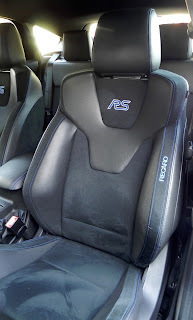 An optional RS2 package (navigation, heated exterior mirrors, heated steering wheel, heated front seats, power-adjustable leather seats with suede inserts and RS markings, six-way power adjustable seats with two-way lumbar support and leather upholstery with suede inserts plus optional forged aluminum 19-inch wheels over standard 19-inch alloy and the $875 destination and delivery charge ran the total cost of my test vehicle to $41,550, over the base MSRP of $35,900. That’s a pretty good jump over the mid-$20K that the basic Focus runs. A well-equipped Focus ST stays under the $30K mark, and a fully-loaded ST just inches past it. It would be a nice alternative if the RS is out of your budget range. 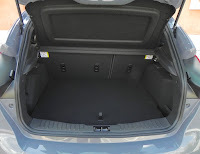 What I liked about the 2017 Ford Focus RS: There’s a good bit of space for cargo behind the second row, and you can gain a lot more by folding those seats. Having four doors makes getting into those rear seats nice and easy. The Sync3 system is intuitive to operate, though to me the ability to make adjustments by swiping or pinching your fingers on the screen falls into the just-showing-off category. The map display clearly shows plus or minus to change the scale. What I didn’t like about the 2017 Ford Focus RS: The backseat isn’t what you would call cramped, but it is snug. I wouldn’t want to be one of three passengers back there. Would I buy the 2017 Ford Focus RS: A $40,000 price tag (for a Focus?) would give me some pause. 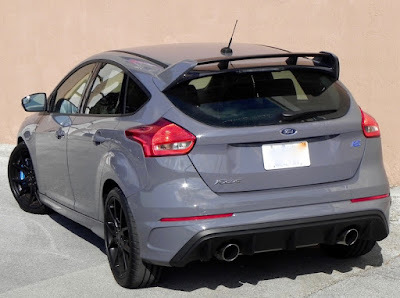 I might take a longer look at the Focus ST and pocket the difference. But if you’re looking for the ultimate hot hatchback, the RS is it. It wasn’t all that long ago that the idea of vehicle coming out of a Hyundai plant carrying a price tag of over $70,000 was as farfetched as the notion of self-driving and flying cars. Well, today self-driving cars are, if not around the corner, getting closer, Uber has asked a NASA engineer to do research on flying cars, and Hyundai indeed has on the market a sedan that is very worthy of such a lofty price tag. 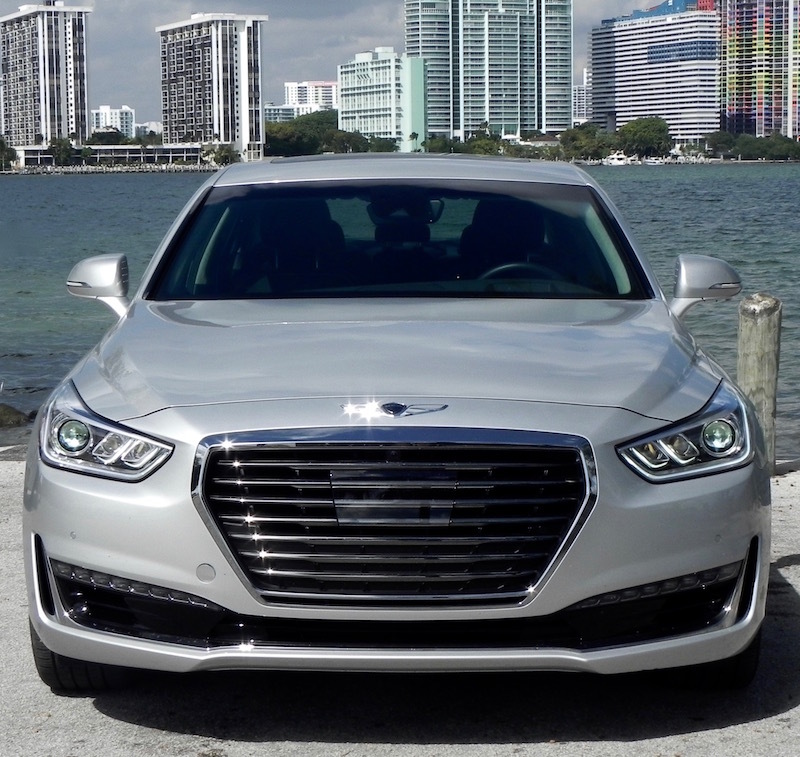 The South Korean company has made the Genesis marque its own separate luxury brand, pretty much like other Asian automakers such as Toyota with Lexus, Honda with Acura, and Nissan with Infiniti have done. The 2017 G90 serves as the flagship sedan of the burgeoning Genesis lineup, the larger of the two models currently offered. 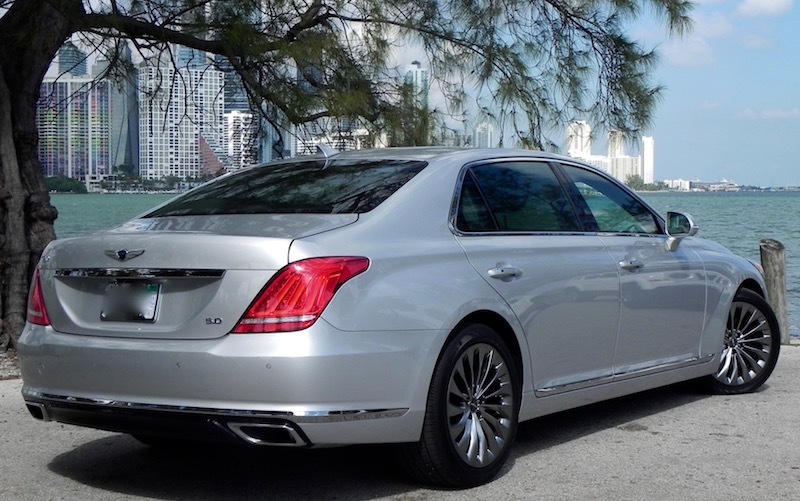 The G90 essentially is a new version of what was once the Hyundai Equus, the company’s first luxury entrant in the U.S. 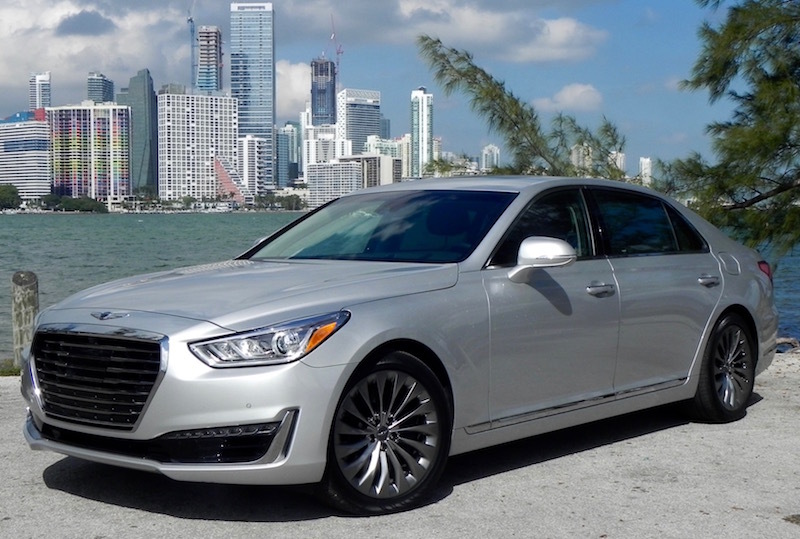 The G80 takes over what was the 2016 Hyundai Genesis sedan. 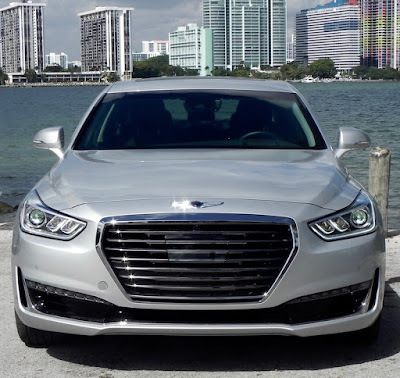 The G90 is offered in two versions with the 3.3T Premium coming with a 3.3-liter, twin-turbo V6 engine for a base price of $69,050 (with the $950 destination and delivery added in) and the 5.0 Ultimate featuring a 5.0-liter turbo V8 checking in at $70,650. That’s for the rear-wheel-drive versions. Available AWD adds $2,500. The G90 for my test drive was the Ultimate trim with RWD and came with a long list of standard equipment, like a full-color heads-up display for speed and navigation display, a navigation system with a 12.3-inch screen, multi-view camera, blind-spot detection, front and rear park assist, lane-keep assist, surround sound audio system, wireless device charger, Nappa leather throughout, a suede headliner, three-zone climate control, sunroof, and acoustic laminated windows. The driver’s seat on the G90 Ultimate is power adjustable 22 ways, the front passenger seat 16 ways, the right rear passenger 14 ways, and the left passenger seat 12 ways. All are heated and ventilated. Even the Princess and the Pea would be comfortable in these seats. You can adjust interior ambient lighting to your liking, and lamps mounted in the exterior side mirrors illuminate the ground as you approach the vehicle. In other words, the G90 Ultimate with its V8 power offers all the luxury of a top-of-the-line luxury vehicle, including the traditional leaders from Europe but for much less money (competitors check in around $20,000 higher and that’s before you start adding option packages) and is only slightly more than the V6. Frankly, though I haven’t driven the V6, I’d have to say the V8 is worth it. It is rated at 420 horsepower with 383 pound-feet of torque available. It does drink premium fuel, but does so at a rate of only 16 miles-per-gallon city, 24 highway, and 19 combined, only a mile-per-gallon off that of the V6 with its 365 hp and 376 lb.-ft. of torque. An 8-speed transmission is common throughout the lineup. It is shiftable via steering wheel-mounted paddles, though, quite frankly, I never bothered. You can set the G90 in one of four different driving modes: Eco for fuel saving, Smart for normal conditions, Sport for a more dynamic performance, or Individual, for customized settings. In any setting, you get a pleasant driving experience with the kind of throttle response, quietness, and smoothness expected — no, make that demanded — of the class. Why shift when the car adapts to your own style so readily? Passenger comfort is A-plus as the G90’s suspension makes the car virtually glide over bumps or railroad tracks but without a mushy feel. I drove it mostly in Sport mode with its firmer suspension setting and heard no complaints from the right side. In fact, just the opposite. At least for now, you won’t find standalone dealerships for the Genesis but there are separate showrooms in Hyundai dealer facilities. 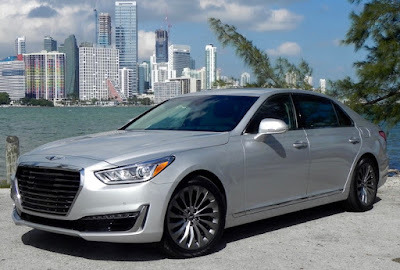 Customer-driven programs for Genesis buyers include valet service appointments (with a complimentary courtesy car), complimentary scheduled maintenance for three years or 36,000 miles and Genesis Connected Services for three years or 36,000 miles. Connected Services includes such cloud-connected features as Destination Search Powered by Google, remote door lock/unlock, car finder and stolen vehicle recovery, among other things. In other words, typical features of what luxury shoppers/buyers expect these days. What I liked about the 2017 Genesis G90: I didn’t get into all the technology that comes with the G90, but it’s considerable. 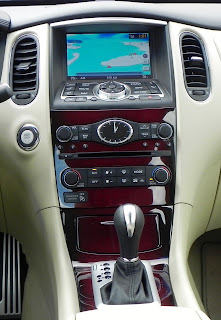 The good thing about is that basic systems, like nav and audio, are very intuitive to operate. If it doesn’t develop something from scratch, Hyundai seems to have the knack of taking the best features of the techno stuff its competitors offer and dumbing it down so you don’t need to dive into the owner’s manual to get it to work. 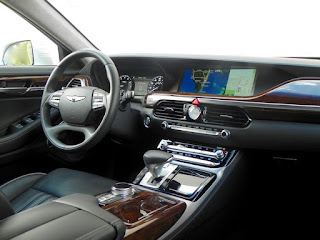 What I didn’t like about the 2017 Genesis G90: The nav system, while pretty easy to set up, wanted to take me on a strange route to at least one destination I inputted. I knew the general area where I wanted to go, but needed the final turns outlined for me. I thought the system was having me avoid tolls, but the settings didn’t require that so I don’t know where it would have taken me. But it would have been longer. Also, the wood trim, though real, has a plastic look about it. Would I buy the 2017 Genesis G90? Yes. Unless you are a brand snob and just have to have a European import, there’s no reason to skip over the Genesis. A couple of years ago at the Shanghai Auto Show Mercedes-Benz unveiled a concept vehicle that was a coupe version of its GLC SUV. 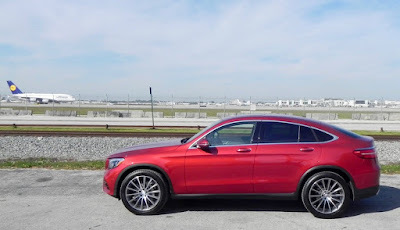 I wasn’t there, but apparently the reception was such that the German automaker hustled it into production, and thus we have the 2017 Mercedes-Benz GLC Coupe. Exactly how you get to an “SUV Coupe” is you take a regular SUV and slant the roofline back starting at the “B” pillar to give it a more rakish look, taking care to extend the length enough so that the backend doesn’t take on the appearance of the much-ridiculed and long-defunct Pontiac Aztec. 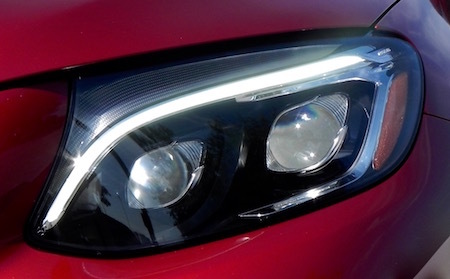 Then you add distinctive styling touches to the grille, and, uh, uh, that’s really about it as far as looks go. 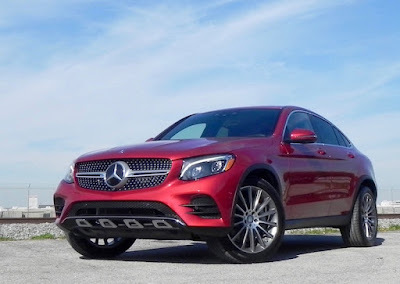 Though company publicists herald that the GLC Coupe combines the “elements of a coupe with the design language of current SUV models,” what you really have here some might call a hatchback. But somehow its seems like blasphemy to use the words Mercedes-Benz and hatchback in the same sentence. You get some, but certainly not all, the attributes of both the SUV and a coupe. The GLC Coupe’s hauling capacity doesn’t match that of the SUV version. Though the company doesn’t reveal the size of the stowage area among specs available on the website, take my word for it. 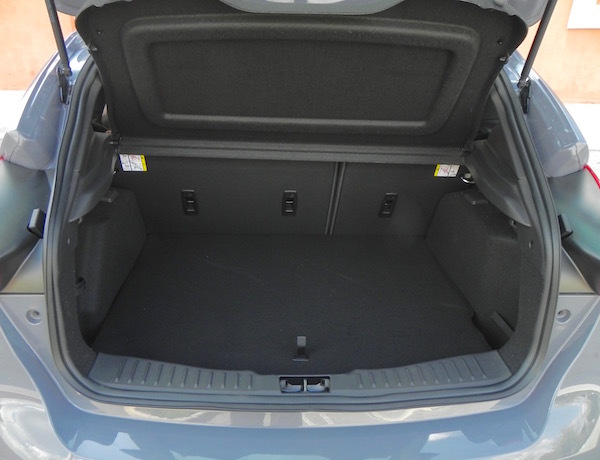 It’s bigger than the trunk of a typical coupe, but falls short of what you get from a midsize SUV. That’s because that sloping roofline intrudes on that space at the rear. That roofline also cuts down on backseat headroom as well, though unless you’re hauling a couple of NBA forwards, that shortage probably won’t come into play much. Also, though the somewhat expansive hood might give you the impression you are behind the wheel of an SUV, the GLC Coupe does have lively handling and driving characteristics. I happened to have the GLC300 for my week of driving. It features a 2.0-liter, turbo-charged 4-cylinder engine that is rated at 241 horsepower at 5500 rpm and delivers 273 pound-feet of torque between 1300 and 4000, which is more than adequate for the task of getting it moving quickly. The Coupe comes with a nine-speed automatic transmission with paddle shifters for manual gear selection and five drive modes (Eco, Comfort, Sport, Sport+, and Individual). Mercedes’ 4MATIC four-wheel-drive system is standard. That puts fuel economy figures at 22 miles-per-gallon city, 27 highway, and 24 combined. For those wanting more oomph, the Coupe also gets AMG treatment with a GLC43 model that gets 342 horsepower out of its twin-turbo V6 and, the company says, zips from zero-to-60 mph in less than five seconds. 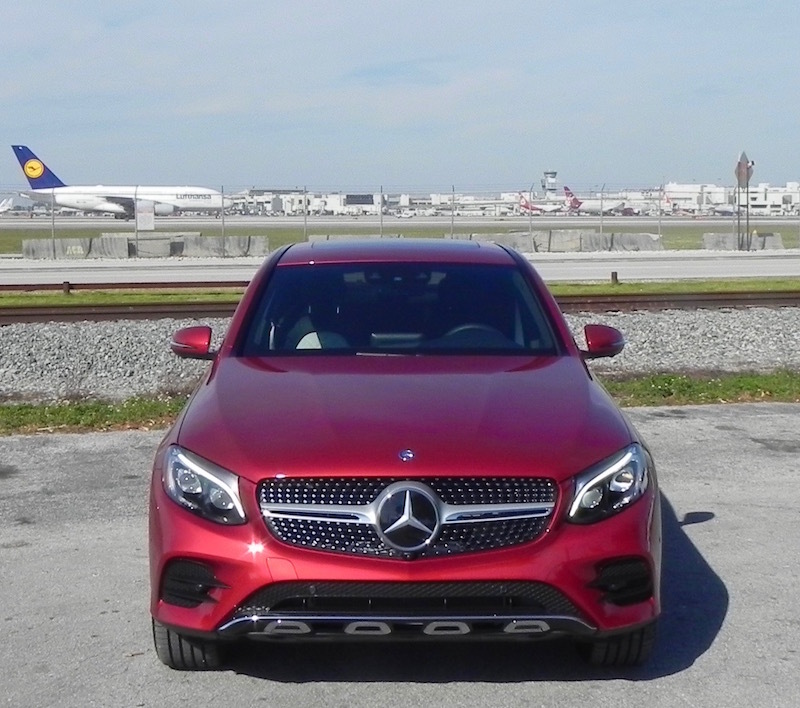 Time for the GLC300 Coupe is 6.2 seconds. In addition to the straight-line power, the GLC300 Coupe delivers the kind of ride and handling that Mercedes is known for. There’s such a solid feeling you get on the road from the way the Germans, especially those at Mercedes, engineer the suspensions of their vehicles. That’s a result, I was once told, of designing vehicles for the high speeds of the autobahn. Whatever, it works. There’s lots of luxurious touches and high grade materials that are pleasing to the eye and touch in the GLC300 Coupe. Standard features include Bluetooth connectivity, power front seats with lumbar support, dual zone automatic climate control, a power liftgate that can be opened by waving your front under the rear bumper with the key on your person, rain-sensing windshield wipers, LED headlamps, rearview camera. 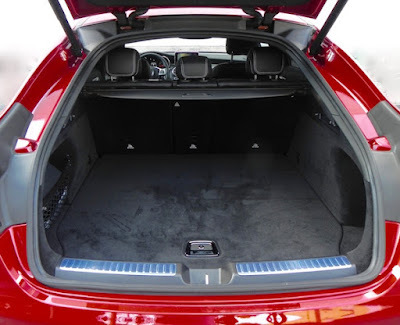 But to get to the good stuff, like navigation, heated and “active ventilated” front seats, air suspension, premium audio, active lane-keeping assist, premium Nappa leather seating surfaces, wood and aluminum trip touches on the console and door trim, and a parking assist system (and lots more) you have dig deeper for option packages. That ran the total for our test model from a base MSRP of $45,950 to $66,435, including the $925 destination and delivery charge. That’s a pretty hefty jump but one you have to make if you want the full benefits of owning a Mercedes. What I liked about the 2017 Mercedes-Benz GLC300 Coupe: Appearance is largely a matter of taste, but I like the way it looks both inside and out. It’s a quiet vehicle, and the throttle response is what quick and sure. Setting your “Individual” mode gives you the kind of responses/ride you prefer, or you can just leave it in Sport+. What I didn’t like about the 2017 Mercedes-Benz GLC300 Coupe: I’m getting used to operating the infotainment system (navigation, audio, etc.) by twirling the knob and making selections on the screen, but now designers need to look into incorporating the 8.4-inch display into the flow of the dash instead of leaving it sticking up like some sort of afterthought. 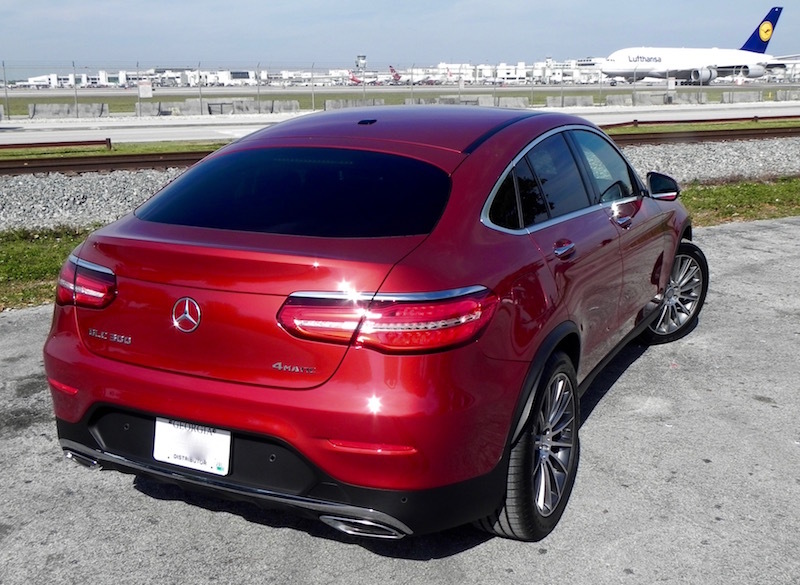 Would I buy the 2017 Mercedes-Benz GLC300 Coupe? If I didn’t need the hauling capacity of that the SUV version offers, yes.